A Photography Workshop is probably the best way to advance your skills quickly, at a pace that suits you. From complete beginner with no knowledge to the more experienced, I tailor tuition to suit your needs. I will show you techniques in an easy to understand manner and help you advance to the next level. 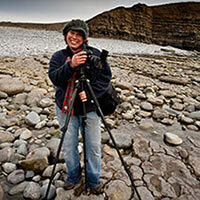 You will learn landscape photography much faster with tuition in either a group workshop or 1 to 1 workshop. My aim is always to give you my full attention and assess your ability and needs. From this I will guide you and help you progress, whether it is creative ability, technical, or both. 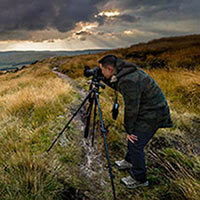 Workshops are held in a variety of stunning locations in Yorkshire, Lancashire, Derbyshire, Wales, Northumbria and the Peak District, with scenery that will with guidance get you images you will be proud of. I will provide transport between locations and accessories such as filters and tripods are available if required. After your workshop you will have a better understanding of your camera, it's functions, and how to capture amazing images like the pros. Workshops are focussed on your needs and will cover the technicalities of your camera, what various settings are for and more importantly when you should use them. We will also cover the creative side, how to see the shot, how to compose, and how to get the best from a scene. Book and pay by deposit online, after which I will contact you to discuss your chosen location, dates and your requirements. Alternatively please email me with your requirements and dates, and I will be happy to discuss your workshop with you. We will cover a wide range of subjects from camera technique to creativity. I will always discuss with you first what you think your needs are, so you are more comfortable and will advance faster, assessing progress throughout the day. 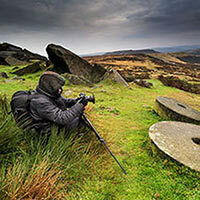 Workshops are held over a wide area of the North of England in selected areas because of the diversity of photography opportunities, including stunning landscape views, and areas of beauty on the coast. If you are not close to one of these areas please contact me, I may be able to travel to you. Some workshops are only available as Group workshops. If you prefer a workshop near your home that can be arranged. Please contact me with suggestions of areas you know and I can research them to find the best locations, download OS maps, find sun positions and high/low tide times. Your camera and empty memory card. Despite what you may think any DSLR will be capable of capturing great images with the right technique. 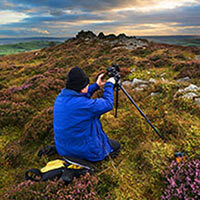 For landscapes a wide angle lens is ideal and a telephoto lens will also offer good opportunities. A cable release is useful and they are very cheap. if you don't have one the self timer can be used. Your camera manual. If you don't have it you can usually download one to your phone. A tripod. 2 spare tripods are available if required, groups will need their own. Good warm clothing and waterproof coat, even in summer, at dusk it can get very cold in the wind. Sturdy walking boots are essential. Wellington boots are a good idea for visits to the coast or streams in the Peaks. "You were tirelessly patient from dawn till dusk, and the Processing workshop has got me well on the way. I learned more in one day that I have in months, and my Nisi filters are superb." "I learned so much from both our workshops and had such an enjoyable time, thanks for showing me such amazing places and teaching me so well"
"Thanks Phil, I know how to use my camera now! maybe next time some night photography. Still amazed how much you know and how well you teach!"